“Asia? You framed an Asia poster? How hard did the people at the frame store laugh when you brought this in?” Movie quotes aside (The 40 Year-Old Virgin, if you didn’t recognize it), some music either isn’t for everyone, or—simply because of a band’s genre or reputation—some folks never give them a chance. Today’s band gets essentially the reaction from the quote above, but I’m going to give the album a shot anyway. Asia began in 1981 with the break ups of the bands Yes and Emerson, Lake & Palmer. Seven years earlier after the demise of King Crimson, there was talk of building a progressive rock supergroup but never truly materialized. Enter the ‘80s and essentially cherry picking from the three bands to pave the way for Asia. Their first recordings with David Geffen were considered disappointing by critics. Since most of the tracks were so radio friendly, they got lumped into a bucket with other pop bands like Journey, Boston, and Styx. They tried to tinker their sound a bit, introducing a new lead singer to try to give the band a bit more of an edge—but that idea was nixed fairly quickly. They decided to move forward with what they had, with the goal in mind to make the best album-oriented rock album in history, and be a cut above the other compared acts. 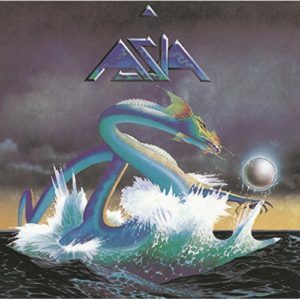 Asia’s self-titled debut was released in March of 1982. Initial response was mediocre to say the least—until the single “Heat of the Moment” began hitting the radio in April. According to Billboard and Cash Box Magazine, it was the #1 album in the U.S. for the year. The aforementioned single would reach all the way up to #4 on the Billboard charts and begin to open music fans ears to the band. Their success on the charts would end up being both a blessing and a curse for the group, as the critical reviews of the single (and subsequently, the album) were incredibly mixed because of the pop-oriented sound. Some called it pompous and lyrically stale, while others at least offered the grandeur of the music was top tier, which radio needed at the time. Since sales are king, the proof is in the cash pudding. The album would go on to be 4x platinum in the U.S., with over 10 million copies sold worldwide—not too shabby. Progressive rock is truly a hit or miss concept. It’s not hard when you’re listening to this to think it’s a real love it or hate it type record. From a personal perspective, I think it’s safe to say I was biased against this album going into it, since the songs I’ve heard before weren’t really my taste. Did that change after listening to it? Not really—but I will agree with critics to the extent of, you can’t deny the incredible arrangements to the album and the theatrics of it all. Even when you look at the album artwork, which was commissioned out to a well-known cover art specialist, the band put a lot of effort into every meticulous detail. Anyone can respect a group that puts so much time into their craft, even if it isn’t necessarily in their personal style. The over-the-top nature of all of it, from the ballroom sound to the leviathan gazing into an orb cover art—I think that’s what would make the frame store employee laugh, not necessarily the music. Asia didn’t last particularly long, calling it quits in 1986. A slight lineup tweak and they were back in 1989 and are still going strong today. Half of the band is still original, which is almost unheard of for acts of that era. They never quite captured the lightning in a bottle they had with the debut, but for a pittance of $5 dollars today, you can go back in time and relive the heat of the moment. Thank you for continuing this series. I always enjoy reading your write-ups, even if they’re albums I already own, or bands that $5 is too much for me to spend on. Thank you for the kind words Justin! I’ll keep ’em coming every Tuesday!